The heavy tank design bureau in Leningrad had reversed many years of Soviet practice by naming their new tank the Klimenti Voroshilov, or KV, after the egregious Defence Commissar. With some courage, Koshkin told Voroshilov that the new tank should not be named after another hero of the Soviet Union; rather they should return to using the traditional designations. Koshkin suggested the designation T-34 to commemorate the 1934 state decree which ordered a massive expansion of the Soviet armoured forces. It was also the year that Koshkin had had his first ideas about the new rank. Accordingly, Koshkin's proposal was accepted. Once the team received official sanction to build a purely tracked medium tank, they had returned co their original design for the A-32. The tank T-34 required thicker armour, but it also needed to be equipped with more firepower as well as a reliable transmission. Morozov and the transmission group devoted considerable time and effort to finding a solution to these problems. The two prototypes were ready by January 1940, and Koshkin took them on a gruelling trial march to prove the hardiness of the design. 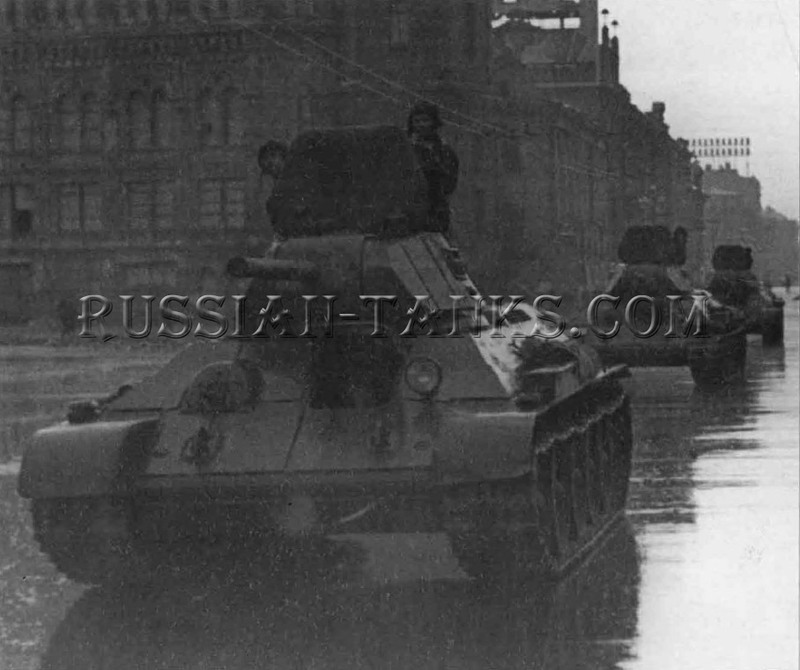 He drove them from Kharkov to Moscow, and here the tank T-34 was presented to the Red Army. Following this presentation, they were sent on to Finland for combat tests against the Mannerheim Line, but unfortunately they arrived too late to see any action. However, Koshkin and his team were able to demonstrate the power of the T-34 is armament against captured Finnish bunkers. There were further firing trials in Minsk, and then it was on to Kiev, and finally back to Kharkov. This round trip had covered a distance of 2880 km (1800 miles) in the bitter weather of February and March. During June the drawings were completed and mass production began. 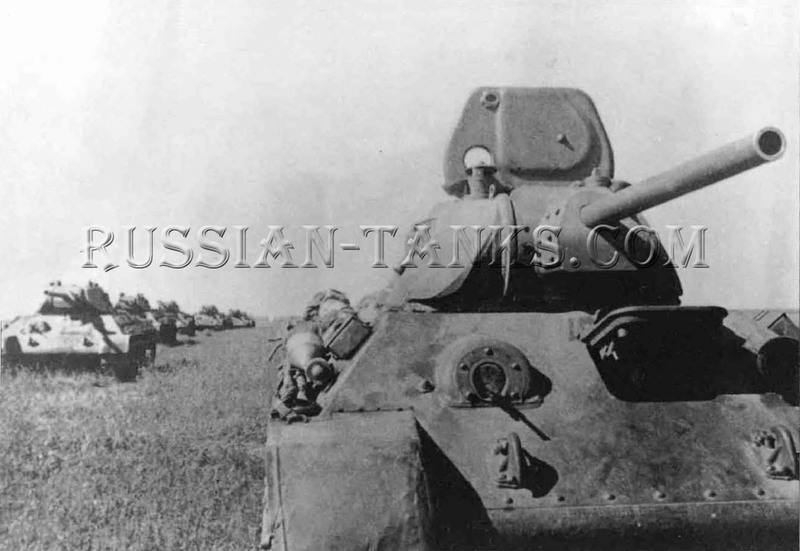 The first production T-34 Model 1940 rolled out of Kharkov in September 1940. During the gruelling winter test-drive. Koshkin had contracted pneumonia, and he died on 26 September 1940. Morozov, now head of conceptual design, rook over the T-34 project. The chassis, based on the Christie system, had five pairs of large road wheels with a gap between the second and third. Each wheel's suspension was independently mounted. and transversely swung on a vertical coil spring inside the hull. The drive sprocket was mounted at the rear to reduce vulnerability. It was the same roller type used on the BTs. The drive sprockets drove wide, 483mm (19in) skeleton-type cast-manganese steel tracks with centre guide horns posicioned on alternate track links. The sys tem had an interesting and ingenious method of retaining its track pins. The roundhead pins were inserted from the inside; there was no retaining device used on the crack itself. Instead, a curved wiper plate was welded to each side of the hull at the rear, level with the top run of the track. Therefore, any loose track pin passing the wiper plate in motion was immediately knocked back into place. The method also allowed the rapid removal and replacement of track blocks, considerably easing and speeding up maintenance and repairs in the field. The wide tracks provided a small specific ground pressure nor exceeding 0,7-0,75 kg per cm (10-10,6 lb per in), while that of British. German and American medium and heavy tanks was 0,95-1 kg per cm (13,1-13,9 lb per in). Track guards covered the top of the suspension system and ex tended 25 cm (9,8 in) beyond the hull at the front and 10 cm (3,9 in) at the rear. The suspension permitted the T-34 to retain high speeds even when moving over rough terrain, while the wide tracks on the tank, weighing only 28,3 tonnes (28 tons), meant that it could traverse muddy terrain, as well as snow-covered ground. The hull, which was designed by Nikolai Kucherenko. overhung the tracks and had sloped sides. It was of homogeneous to lled-steel plate and electro-welded throughout using only three thickness of armour plate: 45mm (1,77 in) front and sides: 40mm (1,57in) at the rear: and 20 mm (0,78in) on the top. The standard of welding was poor, but not so bad as to allow weld failures. The glacis place, set back at 60 degrees, was 45mm (1,77 in) thick and was free of apertures, apart from the driver's harch and the ball-mounted hull machine gun. The driver's hatch also contained his periscope. 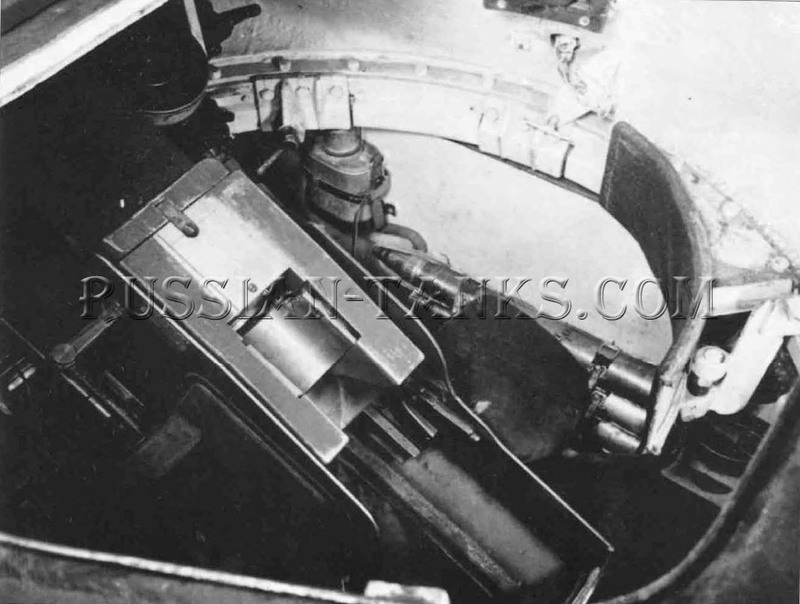 The sloping armour gave excellent ballistic protection and provided the equivalent protection of 75 mm (2,95 in) of vertical plate, making the T-34 tank a virtually invulnerable in 1941. The rear deck behind the turret was slightly raised to accommodate the row of engine compartment louvres and access plate with exhaust pipes on either side. The upper rear plate and the engine cover plate were fastened with screws and these could be removed if repairs on the transmission or engine were ever to become necessary.